The hot and humid summertime has arrived here in Florida. Dog owners face the dilemma of providing their beloved dogs with the necessary exercise in spite of the heat. A regular walk fulfills a primal need of all canines. The problem is, however, that the floors of the not so primal urban and suburban jungles that are home to many of our dogs consist of very hot concrete or asphalt surfaces that they must traverse in order to fulfill this need. Don’t make your dog experience “fire walking”. While you are humming “I’m Walking On Sunshine”, the song by Katrina and the Waves, your dog’s feet could be blistering. Walking on a scorching surface is not pleasant for dogs and can damage their paw pads. Even walking on a sandy beach might be an unpleasant experience for your dog, as the sand can still be very hot. This type of painful walk can even create certain emotional issues and anxieties if the dog generalizes that a walk means an unpleasant experience. Another thing to remember is that dogs do not sweat like humans do. They cool down by panting and they can easily overheat, so outdoor exercise during the hot summertime needs to be modified and adjusted according to the weather conditions. So, you might be thinking, “Should I give up walking my dog altogether in the hot summer months”? Not at all. Just find balance. Provide your dog with exercise outdoors that is both safe and pleasant for the dog. How can you do that? Walk your dog early in the morning BEFORE it gets too hot. Walk your dog later in the evening when it gets cooler and when the sidewalks are cooler if there’s no way to avoid walking on the concrete surfaces. If your schedule doesn’t allow you to provide your dog with daily walks at times when it’s not hot, finding a good dog walker might be a solution. Walk your dog on grassy areas if possible. If you can’t do that in your neighborhood, it might be worthwhile to drive your dog to an area where there is a better surface for a dog to walk on. Use cooling vests on your dog. Provide your dog with exercise in the water. It’s a fantastic way to exercise your dog anyway. A lot of people have beautiful pools, yet they do not introduce their dogs to them properly. Teach your dog to use the pool and ALWAYS supervise your dog. A dog should never be left alone in a pool area. Accidents happen, dogs fall into pools and if they start to panic and do not have experience getting out of the pool safely, they can actually drown. Train your dog to get out of the pool safely and use the pool stairs. Always supervise your dog in the pool area. Some people have pool covers and I did hear a very sad story about a dog that was not being supervised by the owners. The dog got into their pool, under the pool cover, could not get out, and drowned. The owners only discovered this tragedy upon returning home. This is how lack of pack leadership can cost a dog its life. Be a responsible dog owner and provide your dog with security and guidance. If you have a yard, use it to exercise your dog when it is cooler. That does not mean that you simply open the door for your dog, let him out and leave him alone in the yard. That’s not exercise. Be the pack leader. Provide your dog with physical and mental stimulation and always supervise your dog in the yard. A lot of people have huge beautiful lots, yet their dogs are under exercised, bored and frustrated. This is very often a situation in which problem behaviors such as digging, excessive barking, escaping, etc. start to develop. A big yard doesn’t make a happy dog the way that active social interaction with the owner will. Dogs are social animals and they enjoy doing things together with their pack. Make sure that your dog has plenty of fresh water. If you have a deep-chested dog or a dog breed that’s prone to bloat, make sure that your dog does not gulp too much water too fast in order to prevent bloat. tricks that require physical activity, such as weaving through legs, jumping over legs and arms, spinning, etc. Always remember to adjust the amount and type of physical activity to your dog’s personal situation, age, energy level and overall health condition. Young dogs that are still growing should not jump, as it can damage their joints. Make sure that the surface on which your dog jumps is soft. Remember that while exercising your dog indoors only might be easy and convenient for you, it will not fulfill your dog’s need to walk outdoors, sniff new smells, experience social interactions and see the outside world – which are things that all canines need to do. Yes, it is true that it’s hot, but unfortunately a lot of dog owners stop giving any exercise to their dogs altogether during the summer months, depriving their beloved canines of what they need for extended periods of time. That creates tension, frustration and boredom in a dog. A dog that is not able to exercise on a daily basis leads a life out of balance. If you decided to get a dog and you knew that the dog would live in a geographical area that can be very hot, then you knew exactly what you were getting into. People often use the weather excuse as a reason for not exercising their dogs. Quite often, the same people would say that it’s either too hot or too cold, too wet or too windy, or too “something” to exercise their dog. The reality is it’s much easier to find some fun ways to exercise a dog during hot summer months than to change the climate to accommodate dog owners. However, that’s not the problem. If the owner is healthy and physically able to exercise and walk the dog and is choosing not to, then the problem is the human attitude and unwillingness to provide the animal with what it needs. This type of situation is one in which a lot of behavioral problems can develop because the dog does not have an opportunity to simply be a dog. Dogs are domesticated animals, but they will always remain animals with their own needs. They need to exercise and take walks. It is not fair to keep the animal from fulfilling its basic needs and at the same time expect it to behave perfectly and exhibit impeccable manners. Last but not least, depriving your dog of needed exercise can, and often does, lead to obesity, which is one of the biggest health problems in dogs in the US. Dog owners often indulge their dogs with food rewards and increase caloric intake while at the same time drastically decreasing physical exercise. This is not healthy for the dog for both physical and psychological reasons. We dog owners love our dogs, love talking about our dogs and love to proclaim our love to them, but do we provide them with a sufficient amount of physical exercise? Do we become creative when the weather conditions are challenging or do we simply give up and force our dog to become a couch potato? Most of us dog owners realize that dogs do need regular exercise, but unfortunately quite often we ignore that need anyway. Keep your dog fit even in the summer heat! Provide your dog with safe ways of exercising when it’s hot and humid so your beloved canine companion can stay fit all year round. Maybe your commitment to fulfilling your dog’s basic needs will inspire you to come up with some fun activities that you and your dog can do together. 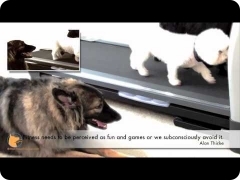 Maybe your desire to fulfill your dog’s needs will even motivate you to keep fit. Have fun with your dog and be a pack leader who shows love through caring about your dog’s physical health psychological well-being, stamina and emotional balance. Contact Fine-tuned Canines about our programs to help your dog to stay fit even during the hot summertime. Lexi Hayden is a professional dog training instructor, canine behavior specialist, owner of Fine-tuned Canines, and a proud member of the International Association of Canine Professionals. Fine-tuned Canines provides dog training and canine behavior counseling services to residents of Southwest Florida. She can be reached at (239) 935.5391 or info@fine-tunedcanines.com.